This mainstream German magazine Der Spiegel in their December 30th issue, tell us that Wall Street banksters committed nothing short of a monumental insider bank robbery, which is responsible for victims like Pam Brown who has become the face of America's nouveau poor and hungry in the minds of the Spiegel's vast readership within the European Union. The Spiegel's article also tells us that America's has a short memory. Barely 2 years after the market crashed, Wall Street is in the process of creating a second crash by speculating just as shamelessly as they did before. The Spiegel article suggests this maybe happening because there were no criminal prosecutions ever brought. Therefore it looks like the Wall Street banksters are going to do this again. To which this diary asks, how many more times do you want to bail out Wall Street? How much longer do the bread lines have to get, how many more millions have to lose their homes? Is 59 million without medical insurance enough? When will America say no to Wall Street and yes to Main Street European style social safety net? New York Times FiveThirtyEight's Nate Silver offers his take on Merriman River Group's congressional polling for that site that inflates it's stats. ...that's putting it mildly. Hopefully, in the future the statewide media will take future polling from CTCapitolReport with a grain of salt. "Ms. Warren will be named an assistant to the president, a designation that is held by senior White House staff members, including Rahm Emanuel, the chief of staff. The title of the Times article says it all: Warren to Unofficially Lead Consumer Agency. Of course, President Obama could have set it up for Warren to officially lead the agency through an interim appointment. Warren's outstanding efforts and her extraordinary record of being right on the issues are more than enough justification for that. 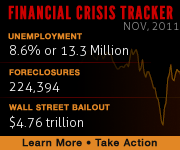 Sourcewatch has developed a great widget to keep a running tally on what some call "The Great Recession". The Financial Crisis Tracker gives a monthly snapshot of housing foreclosures, unemployment rates and the total cost of the Wall Street bailout. The Tracker is presented in the form of a widget that can be downloaded to your webpage. 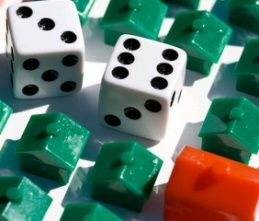 The Foreclosure number is generated monthly by RealtyTrac, a private data source used by newspapers across America. The RealtyTrac data is released in the second week of the month for the previous month. The Unemployment number is generated by the U.S. Department of Labor and released on the first Friday of the month for the previous month. The larger DOL data set is rich with information about unemployment and underemployment in the U.S. economy. The Wall Street Bailout number is our original calculation of the total bailout expenditures to date. Our calculation was peer-reviewed by economists at the Center for Economic and Policy Research in Washington D.C. Our table tallying all government bailout programs can be accessed here. Open Thread: Wall Street Reform Vote Coming? Read more about Open Thread: Wall Street Reform Vote Coming? 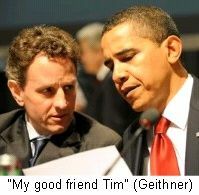 (March 10) Wall Streets is headed toward international pariah status thanks to two recent actions by the European Union (EU). On Tuesday, the EU announced that it was banning Wall Street banks from the lucrative government bond business in Europe. They didn't express official concern or fire off a warning shot. 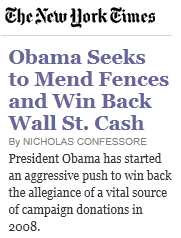 They simply banned Wall Street from financing government bond deals like the one Goldman Sachs sold to Greece. The Guardian pointed out that Wall Street bond business from European governments has gone down over the last two years. Now the business is gone period. In effect, the EU has labeled Wall Streets business tactics as too dangerous for their governments to handle. Then on Wednesday, the President of the European Commission said that the EU was considering a ban on government debt speculation through Credit Default Swaps (CDS) President José Manuel Barroso announced that, "the Commission will examine closely the relevance of banning purely speculative naked sales on Credit Default Swaps of sovereign debt." While not an outright ban, the threat of banning CDS on national debt would be a major loss for the world's financial speculators, particularly those in the United States and Great Britain.